Shimano TRITON BAITRUNNER 6500 PLUS Spinning Reel Made In Japan. Great condition. Has been in storage for the past 20 years so minimum use. Shipped with USPS Priority Mail. Authorized DAIWA Dealer -- Power Cables Included!!! Works Great . Nice clean reel. Reel is in very good, if not excellent condition. 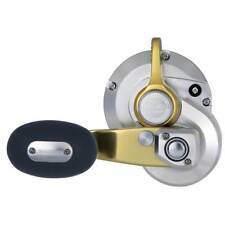 New Daiwa Certate HD 3500 SH saltwater spinning reel. JDM model. Max drag 17lbs, 6.2:1 retrieve. Made in Japan to Daiwa highest standards. Reel action is smooth as silk. This reel was mounted on a rod for sizing only. Item # 1481264 (SSVI6500). 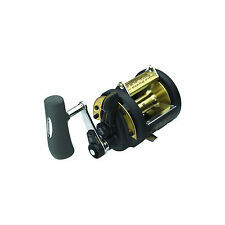 Penn Spinfisher VI 6500 Spinning Reel. Our HT-100 drag washers are housed in a fully sealed spool to give the stopping power needed for big saltwater fish. Reel Size: 6500. The reel does have little corrosion on the nut /bolt of the clamp. Excellent reel for throwing jigs or flylining. Happy buying. New Version! US 1-4 Days Free Post! Multiple Species! Vintage Penn Senator 9/0 115 Saltwater Fishing Reel. Beautiful Reel in Excellent Condition! Functions flawlessly perfect and super smooth! Cosmetically is a solid 9 of 10! Comes with rod clamp and harness. Ships as soon as payments are received. Any questions please do not hesitate to ask. THANK YOU FOR BIDDING AND GOOD LUCK! Sincerely Matt M.
With max strike ranging from 30lbs up to 170lbs, you will never miss any species, no matter inshore flat fishing, or offshore for shark. Rod Clamp included, Reel Cover included. 2, Accessories. TX15L, Max Strike 30Lbs, Mono 10lbs/430yds Braided 40lbs/450yds, Gear Ratio 6.0:1 Left Handed. Superline Spool. Friction trip ramp prevents premature bail trip when casting. 5 sealed stainless steel ball bearings. 340/20 300/25 230/30. 335/15 230/20 210/25. 5.6:1 19.8(oz). BTLII5000 225/12 200/15 135/20 300/30. Works great. Nice clean reel. Model: Fathom FTH40LW. Saltwater Fishing Reel. 3 shielded stainless steel ball bearings. Braid: 50/825, 65/675, 80/575. Stainless steel Tin coated level wind system. Instant anti reverse bearing with silent back up ratchet. Penn Fishing Reel Squidder 140 Made In USA. New ones are made overseas i hear. Condition is Used. No corrosion, a very small scratches, i ground down some personal info etched into the reel seat. Shipped with USPS Priority Mail. Old stock penn reel, works perfectly, super smooth, drags are good. Loaded with 25 lb test Maxima line. Right Hand with line counter. Penn 9500SS in Excellent used condition. Works great very smooth good bail pop, looks like 20lb. 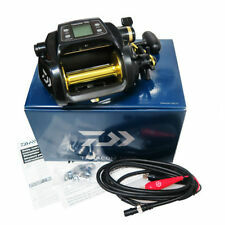 Accurate SR-50 Twin spin reel. Largest spinning reel made, a beast. Holds 450yds of 130lb braid with 45lbs drag. Excellent shape, for the perfect rod see my auction of a 1x3 super seeker (long beach) spinning rod! Our HT-100 drag washers are housed in a fully sealed spool to give the stopping power needed for big saltwater fish. Available in standard, Live Liner, Long Cast and bail-less models. PEN-1675 Spinfisher VI 4500 6 6.2:1 20lb 320yd/10lb 12.5oz. STTLW20HA - / L 4CRBB, 1RB 6.1 : 1 35.0′ 18.5 12/420, 14/350, 20/210. Daiwa Saltist Levelwind 20HA. Saltist Levelwind Reels. Now you can have proven Saltist™ reel performance with the added convenience and efficiency of a levelwind. 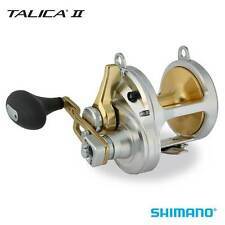 Shimano TLD 2-Speed Conventional Reel. Aluminum Spool. SPECIFICATIONS: Retrieve: Right | Gear Ratio: High 4.0:1 Low 1.7:1 | Weight: 37.5 oz | Bearings: 4 A-RB | LPT: 37/16" | Max Drag: 33lb. | Capacity: Mono 20 lb/800 yd, 30 lb/600 yd, 40 lb/450 yd, 50 lb/350 yd; Braid 50 lb/1210 yd, 65 lb/1015 yd, 80 lb/910 yd. Shimano Baitrunner D 4.8:1 Right/Left Hand Spinning Fishing Reel - BTR8000D. This classic live bait reel from Shimano® (with the secondary drag system that allows freespooling with the bail closed) gets a big update to allow your bait to move naturally. Good used condition as shown in photos. Penn Spinfisher SSVI3500, 1481261. ANTI-REVERSE FEATURE Instant Anti-Reverse. COLOR Black Gold. DRAG MATERIAL HT-100. DRAG TYPE Front Drag. REEL HANDLE POSITION Right/Left. REEL SIZE 3500. WEIGHT 12.10. Check the photos on this fine reel. 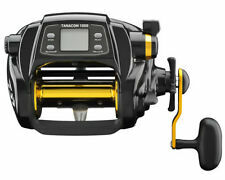 Shimano Trinidad TN14 reel (mint condition). Condition is Used. Shipped with USPS Priority Mail. The ultimate workhorse, the TLD15 Offshore Lever Drag Fishing Reel features four stainless steel ball bearings, gears, main shaft and spool, and a graphite and titanium body. Item model number: TLD15. Penn Battle II 3000 BTLII3000 - Extremely Fast Shipping! Penn Senator 114 6/0 WHISENHUNT ELECTRIC Fishing Reel BUY NOW! Paired with beautiful ocean views and the prospects of large, hard-fighting fish, it is easy to see why offshore fishing is becoming a destination holiday for so many anglers. One of the most crucial pieces of gear in your tackle is the saltwater fishing reel. The choice in offshore fishing reels can make the difference between landing that big Marlin or going home empty handed. What are the various types of saltwater fishing reels? Baitcasting - Often used on rods mounted directly to saltwater fishing boats, baitcasters are very heavy and are designed for large fish species such as sharks, marlins, and tuna. Some are designed for actually casting bait, while others are designed for trolling. Spincasting - Designed for small-sized to medium-sized fish, the spincasting reel is lighter than the baitcasting reel and is mounted on the underside of the fishing rod. This tool often needs an experienced hand as it is very prone to line twisting if the proper technique is not used when landing fish. Spinning - Less advanced than the spincasting class, the spinning reel is often the choice of beginning saltwater anglers. Due to the smaller size and lower line capacity, these reels aren't suitable for deep sea fishing but are quite effective for pier fishing and surf fishing. How do you choose the correct saltwater reel? What species of saltwater fish are you pursuing? - Larger saltwater fish require larger and heavier reels like baitcasting and trolling reels, while smaller saltwater types are readily landed with smaller saltwater reels. Where do you plan to fish? - Deepwater and bottom fishing requires a fishing reel with more line capacity and heavier build than surf or pier fishing. What is your skill level? - A beginning angler may have trouble with the learning curve of the more advanced reels, leading to lost fish or dampening their enjoyment of saltwater fishing as a sport. What kinds of saltwater fishing reels does eBay offer? Brand: If you prefer a specific type of brand, eBay offers Abu Garcia, Accurate, Avet, Daiwa, Fin-Nor, Okuma, Penn, and Shimano. Reel type: Options are baitcasting, conventional, and spinning. Hand retrieve: You can select your reel based on whether you are left-handed or right-handed. Condition: f you are on a budget, you can consider used options. New options are available, too.